We present the first map available for the current version 1.8 of Minecraft. Infinity Dungeon 1.8 is a battle map that will delight those who like wars and battles based on large dungeons. Because as the map name itself indicates, this is a map of infinite dungeons, literally. This map is centered within a limited area of a map, where inside will be randomly generated different kinds of dungeons with many enemies. Once the phase is completed, return to the central building and pull the lever that will generate a “city full of dungeons”, hence the infinite. The map can be played in single or multiplayer, so lets enjoy with your friends! 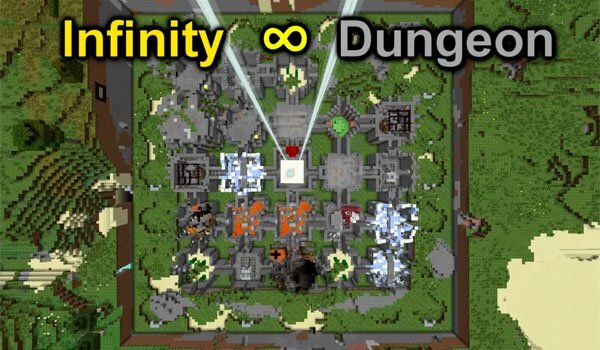 How to install Infinity Dungeon Map for Minecraft 1.8? Let’s battle at the dungeons!